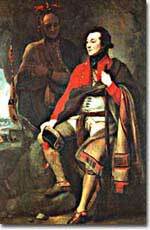 A memorable 1776 portrait by Benjamin West, of British Colonel Guy Johnson (foreground) and Mohawk Chief, Karonghyontye, who was also known as David Hill. Notice the Indian elements in the Colonel's uniform. Washington's towering stature and legacy might misleadingly suggest that the early years of the new nation were times of great confidence and self-congratulation. In fact, just the opposite was nearly the case. Americans knew that the historical record of the long-term success of republican governments was exceedingly poor. Previous examples and classical political theory suggested that republics almost all suffered the fate of collapsing into anarchy and then being taken over by a power-seizing tyrant. 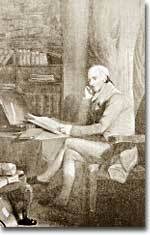 The Philadelphia patriot Benjamin Rush keenly understood the risks facing the new nation. As a result he sharply rejected the idea that the military defeat of the British meant the end of the American Revolution. "On the contrary," he wrote in 1787," nothing but the first act of the great drama is closed. It remains yet to establish and perfect our new forms of government." Besides being a known American patriot, Benjamin Rush was also a premiere thinker in the area of neurology. The unsettled domestic issues that threatened to overturn the new republic were varied and complex. Any one of the major crisis points of the early 1790s might overturn the fragile new government. Where was the greatest threat: the challenging legal and political issues raised during the ratification of the Constitution, the disastrous economy of the 1780s, popular protests against federal policies in the west, or the varied military threats from Native Americans, the British in Canada, and war in Europe? If any one of them could have toppled the government, imagine how their combination must have made Americans fear for the future of the country. Most of these deeply unsettling threats would be addressed by the first federal government and usually in an aggressive manner that scored decisive victory. Interestingly, however, the solutions achieved by the first wielders of federal power also helped to create the conditions that would force them from office and lead to a dramatic change in American politics by 1800. To understand how much changed between the presidential elections of George Washington (1789) and Thomas Jefferson (1800), the kinds of challenges that had to be faced in the first decade of government under the new federal Constitution must be examined. The people of Philadelphia had more than just political battles to fight at the end of the 18th century. They had to fight a plague. How did Phyllis Wheatley, a slave, get her letter read by George Washington?